Sound Wonderful soundstaging, with solid images and a quiet background; sweet tonal character. Features Separate control unit and power supply; isolated sandwich circuit board mounted on spring-loaded towers; damped chassis; five inputs and two sets of outputs. Use You'll need a large shelf to place it on -- and a second shelf for the power supply; 31-step attenuators seem coarse, but work fine. Value Not cheap, but terrific build quality and first-rate sound; the best effort by a coming company. Heres a game that you and your audiophile friends can play -- name that company. Pull out the annual Audio equipment directory, find a product that youve never heard of, read off its name or model number, and see who can identify the company that makes it. An added twist is to earn bonus points for naming the type of product, technology in use, and some expression of its sound. Mix in some beer or wine and you have a game that only a bunch of audiophiles could love. Of course, Im kidding here to make a point: The high end, for all of its technical glitz, is very much a cottage industry. For every Madrigal and Conrad-Johnson there are dozens of smaller companies whose products sell side by side with those of the biggies. And then there are companies like Blue Circle, which started out with just a pair of monoblock amps and a single line-stage preamp (the BC2 amps, $6000-$6300 depending on finish, and BC3 Despina preamp, $3300) and have now added products that are both more and less expensive than the ones that started the company. Voilà, Blue Circle has a robust product line. I will speculate that this quick rise is attributable to the quality of Blue Circle products -- youll have to pry Doug Schneiders BC2 amps and BC3 preamp from his cold, dead fingers -- and also the drive of designer Gilbert Yeung. He could simply rest on his laurels and sell his current products, but Yeung must understand what we at SoundStage! do: This industry demands too much from you to stay small forever. You either have to make it definitively, or save yourself the headaches and just give up. It appears that Blue Circle (and SoundStage!) would rather burn out than fade away. Like many high-quality and costly preamps, the BC3000 is a two-box affair -- separate control unit and power supply. The cases of both are fashioned of #304 stainless steel, which Blue Circle uses for reasons of improved sonics. It also gives the BC3000 and power supply a distinctive mirrored look, which is nicely contrasted by the real-wood knobs and feet. 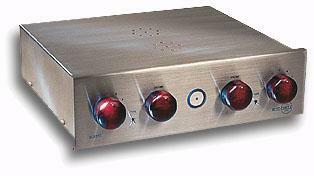 The control unit looks identical to that of Blue Circles BC3 preamp, also a two-boxer. It measures 17 1/2"W x 5 3/8"H x 14 5/8"D and weighs 38 pounds. Its a dual-mono design with mirrored controls for volume and input as well as toggle switches for the tape loop adorning its front panel. It has five inputs and two sets of outputs, all via high-quality Cardas RCA jacks. The power supply is Blue Circles top-of-the-line BCG3.1, which can be purchased separately for use with the BC3 preamp. According to Blue Circle, it is a "very high-current" affair with "massive and very, very fast" filtering. Its rather shoebox shaped, measuring 6"W x 5 3/8"H x 14 5/8"D and weighing 16 pounds. It has a master on/off switch, IEC receptacle, and connector for the custom-designed Cardas umbilical. Both the control unit and power supply have the distinctive Blue Circle logo on the front, which glows when the preamp is on. The preamp and power supply look very chic in the light or dark. The BC3000 employs some interesting and innovative design features that are readily noticeable once you remove the outer cover. The circuit board is a special three-layer sandwich designed to improve isolation from mechanical feedback and rests on spring-loaded towers that further isolate it. However, it merely holds the components -- it has no solder traces. All signal-path and power-supply wiring, done point to point, is from Cardas and kept airborne -- floating above and away from the circuit board -- to decrease signal loss and improve transient response and linearity The cover of the control unit has sheets of Dynamat damping material affixed to its top and sides to help kill resonance and micro vibrations. The dual volume controls are stepped attenuators, 31 positions for each, and the input selectors connect via long rods to the very rear of the unit to shorten signal paths. The BC3000 uses only a matched pair of 6922 tubes, and this will keep the cost of retubing and NOS experimentation down. Both tubes have special damping systems -- two floppy rubber-looking rings -- to help with microphonics. The BC3000 inverts phase, so youll need to add an additional inversion to cancel the effects of the one the BC3000 adds. Flip your + and - cable connections at your speakers. Overall, the BC3000 looks very orderly and audiophile-approved inside. I used the BC3000 along with my reference ProAc Response Four speakers and two pairs of Lamm 6C33C-based tube amps, the ML1 push-pull triode and ML2 single-ended triode designs. My digital setup is the same as it ever was: Timbre TT-1 DAC and Wadia 20 transport, tethered to each other with either a JPS Superconductor2 or Marigo Apparition Reference Series 3A coaxial cable. Interconnects and speakers cables were JPS Superconductor2 and NC Series, although I also use the fine Audio Magic Tubed Interconnect. Power cords were from JPS labs, API, and Audio Magic. In past reviews of high-quality preamps, Ive talked a bit -- sometimes two bits -- about the fallacy of the "straight-wire-with-gain" argument used often in reviews of preamps. My central point is that hearing nothing is impossible when you are (1) listening to a reproduction to begin with, and (2) listening through a long playback chain that will certainly impart its own signature, often many of them. I guarantee that I can describe the sound of any piece of equipment that another reviewer proclaims as being "so good that it doesnt have a sound of its own." Im sure you can too. Poet William Carlos Williams called disorder an unfamiliar kind of order. I would add that in the high-end arena no sound is a sound, unless its literally no sound. Thus, the BC3000 is no less invisible than other top contenders that Ive heard., and yes it has its own personality -- when compared to the rest of the field or even heard by itself. First, no one will attribute a solid-state character to the BC3000, but likewise it doesnt have an overripe, too-tubey sound either. Its sweet and dimensional, but doesnt have any obvious tonal aberrations or tendencies. Patricia Barbers well-recorded Café Blue [Premonition Prem-737-2] sounds very smooth, but also lively and dynamic, which is why its recognized as a well-recorded disc. But the BC3000 does not favor only the best recordings; Jules Shears newest Between Us [High Street 72902], a collection of intelligent, folksy pop songs performed as duets with the likes of Paula Cole, Roseanne Cash, Freedy Johnston and Margo Timmins, is a little too disembodied, the vocals sounding detached from the instrumentation, almost as though they are poorly overdubbed (which they are not). And this is what you hear with the BC3000 in place, along with the hard-right and -left recording of the vocals, which only serves to magnify further their disjoined nature. The BC3000 neither grossly hides nor emphasizes anything fed to it. The BC3000 has excellent soundstage transparency -- the ability to hear into the space on the recording and the placement of musicians all around -- perhaps due in part to how quiet it is. Buena Vista Social Club [World Circuit/Nonesuch 79478-2], the fabulous Ry Cooder-produced collection of Cuban songs performed by Cuban musicians (along with Cooder, of course), is the perfect recording to judge this. The performers populate positions in front and in back of the speakers, and all around. Instead of throwing a half-circle as some other linestages do, the BC3000 hangs a plane of sound from speaker to speaker -- and outside of each -- that then extends backward and forward. The BC3000s treble is extended, as you would expect given the preamps price, but lacking in grain and glare. The BC3000 has an overall light character -- fast but not etched -- but has ample tonal color. It has high-frequency life, but its not too lively to call attention to itself. Even with this lightness, there is a solidity and chunkiness to the images the BC3000 portrays; the now-discontinued Sonic Frontiers SFL-2 could do this too, and to an even greater degree, but it was not as tonally suave as the BC3000. Plucked guitar strings seem to reverberate in air with greater force, and the sound of drumstick on cymbal has more metallic "ting." This is not a function of the attack being quicker and the decay longer; rather, its a matter of everything sounding more substantial and whole. The images project, which is an especially seductive kind of dimensionality. A perfect illustration of this is James Taylors Dad Loves His Work [Mobile Fidelity UDCD 726], specifically the song "Summers Here." Taylors voice is more resolved and full than Ive heard it, and this is a great compliment to the experiential themes of Dad Loves his Work. Performers dont hang in air as much as they take up real space, and the BC3000 is the cause. Once you get past a certain point -- and the BC3000 is -- your choice of which linestage to buy will have more to do with small differences here and there than any absolute betterment. And this is how I would characterize the differences between the BC3000 and my prized Lamm L1 linestage, which costs $950 more. The two units sound very similar, except for a few minor differences that may sway you one way or the other. The BC3000s bass is not quite as deep or weighty as the L1s, but in turn it has slightly better focus on bass-heavy recordings -- in my collection, Im thinking of Harry Connicks She [Columbia CK 64376] and Suzanne Vegas Nine Objects of Desire [A&M 31454]. Like the bass of the Lamm L1, however, the BC3000s bass doesnt sound overly deficient or prominent, or act as an adjunct to the rest of the sound. Its fully integrated and powerful when it should be. The Lamm L1 is a little less sweet in the treble than the BC3000, which doesnt have quite the air of the Lamm. Shawn Colvins Cover Girl [Columbia CK 57875] is the ideal test here; the sibilance on the Tom Waits tune "The Heart of Saturday Night" doesnt sound as hissy or spread out as much through the BC3000, while Colvins voice on "Youre Gonna Make Me Lonesome When You Go," a fine Bob Dylan song, doesnt have the tonal color with the L1 as it does with the BC3000. I wouldnt sweat either of these details or the incongruity in the bass of both units. Both are prime-cut, top-drawer linestages. One can only admire what Gilbert Yeung has built in the scant three years that Blue Circle has been in operation. Starting in the middle of the pack in terms of price and then fanning out in both directions from there, Blue Circle has perhaps given a blueprint of how to create a full line of products and ensure that each individual piece of equipment has distinctive and alluring qualities to potential buyers. Everyone knows that Canadas high-end industry flourishes, due in part to products from companies like Sonic Frontiers, Classé and Bryston. I wont be surprised if sometime soon Blue Circle is added to this high-profile list. Gilbert Yeung just cant seem to sit still -- good for him. Any way you look at it -- or listen to it -- the Blue Circle BC3000, Gilbert Yeungs best linestage effort, is an impressive piece of audio equipment. Its an interesting and innovative design with a build quality -- stainless-steel chassis, damped case, isolated circuit board, external power supply -- that rivals even that of the mighty CAT SL-1 Signature. Its sound places it in the upper crust of line-stage preamps, with a soundstage thats see-through, solid images, and a sweet, never-overbearing quality. Its never too much of anything except musically satisfying. I could live very happily with it -- and maybe you could too.